Is it time to tackle your paper clutter? 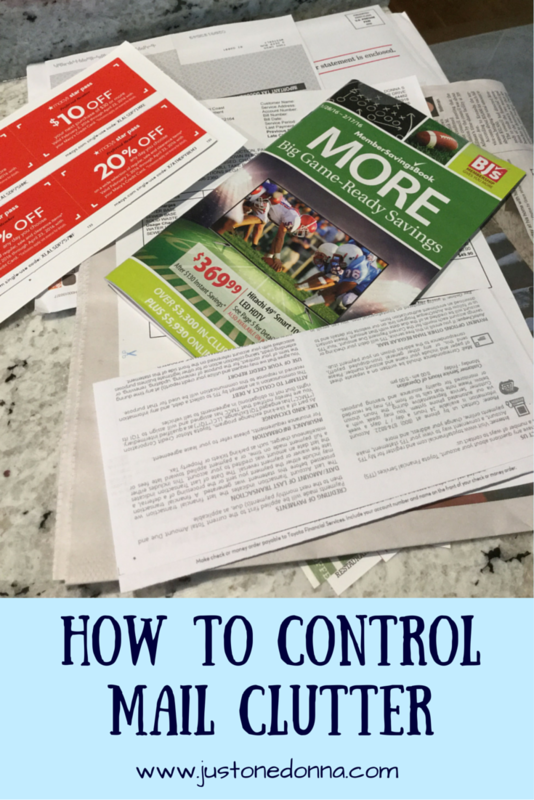 Do you fight a daily battle with the paper that comes into your home via the mail? Are there piles of paper everywhere you look around your home? I've been fighting the paper fight for a long time and have developed an attack plan that works for me. First, deal with your mail right away. This is a daily activity. One of the first things I do is quickly flip through my daily mail on the walk from the mailbox to my door. 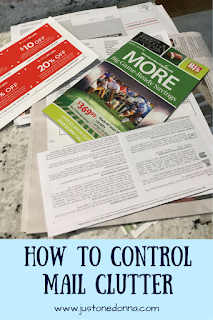 I stop at the recycle bin and toss the junk mail into the recycle bin before I enter the house. That easily takes care of half of the paper clutter. Designate a home for mail. You'll want a handy place to drop your mail once you get in the door. Let's face it. Life gets in the way. You may not be able to sort through your mail the second you get in the door so your mail needs a place to hang out while it waits for you. A decorative basket on your kitchen counter or your hall table will work nicely. Touch each piece of paper as little as possible. We've all heard organization gurus tell us to only touch a piece of paper once. While that is a great goal, it only works for me about 60% of the time. For the pieces of mail that actually make it through my door, the first touch is to open and discard all superfluous inserts from each envelope, sorting the contents into one of three piles: "Bills", "To be Filed" and "Read Later". The bills are placed on my laptop to schedule for payment. The filing pile moves to my "filing" basket, which I file once a week and the reading pile moves to the table next to my favorite chair. Replace paper with digital communication. You may want to replace paper bills and statements with their digital forms. I choose not to do this, but it may be a great time saver for you. Create a paper organizing system. The complexity of your organizing system should fit your needs and personal preference. Do you want a separate file folder for every type of paper? Will creating a file for each month of the year work for you? I do have file folders for a few categories, but if you are like me you'll use a shoebox for all non-tax related and non-financial pieces of mail. The items that go into the box are in chronological order starting with the January. Easy peasy, and it works for me. Establish a paper decluttering/organizing schedule. Perhaps the most important decluttering tip I have learned over time is you need a decluttering schedule and you need to stick to it. The clutter won't take care of itself. As little as five minutes a day can save you loads of grief later on. My recommendation is to take a few minutes a day to discard items and then set aside a bit more time once a week for filing and organizing. Curate newspapers, catalogs, and magazines. Are you still receiving paper versions of your newspapers, magazines, and catalogs? You may want to think about moving to online versions. I've actually done that for many of the catalogs and magazines that were previously delivered in my mailbox. It does help with the paper clutter. My newspapers go into the recycle bin every day even if they haven't been read. Catalogs go into the recycle bin immediately after a quick review or when I do my weekly decluttering. My smartphone has become a big help in my organizing efforts. If there is something I want to remember in a catalog, I take a picture of it with my phone. The same is true of magazines. When there is a recipe I want to remember, I take a picture of it with my phone. If there is a fashion or home decor picture I like for inspiration, I'll take a picture of it with my phone as well. As for all the magazines and catalogs you never get around to reading, it's time to cancel them. You don't have to let mail clutter get the best of you. These few simple steps will help you to feel in control and keep your home clutter free. 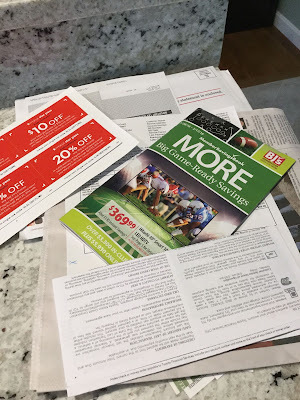 I hate junk mail and I toss it as soon as I see it. It has taken me years not to just toss it on the counter in our catch all basket, but I feel so much better without it! I'm with you, Joanne. Junk mail annoys me to no end. That's why I toss it in the recycle bin before going into the house. Thanks for your comment. Oh my goodness, I HATE mail clutter... I keep trying to get my husband to help clean it up, but it still seems to pile up. I know what you mean, Sarah. Decluttering requires the cooperation of everyone in the household. Good luck controlling the mess!